Back in 2006 shoestring traveler friends who have been with us on a previous trip to Capones Island told us about their night of camping on a remote but lovely cove along the Zambales coast in San Antonio, just beyond the fishing village of Pundaquit. But since our move to San Diego, California was just days away, we had to wait a while before we could experience this destination ourselves. 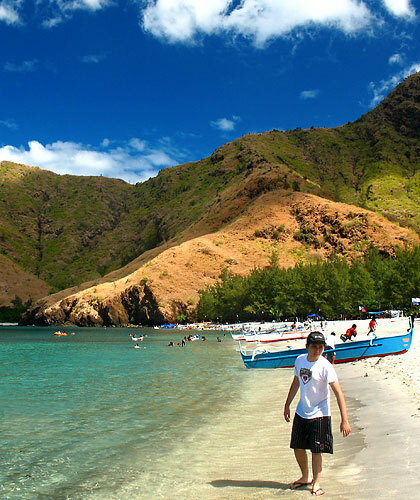 When we returned to the Philippines and got the chance to visit the place three years later, Anawangin Cove was no longer a best-kept shoestring traveler secret. Our first visit to Anawangin took place on a Black Saturday so you can imagine the number of people on the beach that day. (Visiting the place a year later, Leo noticed that the crowds had grown even larger.) 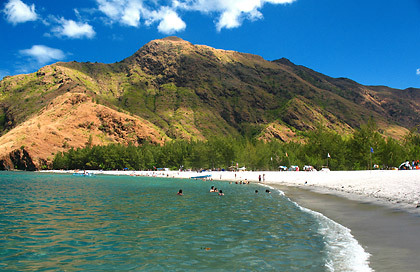 However it is not as crowded as other well-known beaches and is still a beautiful place. 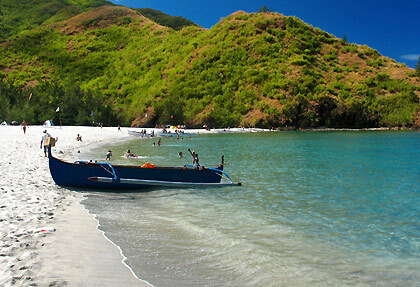 Anawangin is a cove with a white sand beach framed by a number of low hills not too far from the shore. What sets Anawangin and its sister coves in San Antonio apart from most beaches in the Philippine are the evergreen trees lining the greater length of the beach. Known locally as agoho trees, they are often mistaken for pine trees because of the similarities. There was hardly a coconut tree in this area. A creek winds its way just at the back of the sandy beach, separating yet another forest of evergreens from the former and eventually emptying into the sea. This little forest of evergreen trees has become a favorite camping ground for visitors, including trekkers who travel by land from Pundaquit. In his second visit to Anawangin in 2010, Leo observed that a footbridge had been constructed to enable people from the beach to cross the creek and get to the forest. However the creek itself is shallow and fordable especially during summer. Grayish-white volcanic sand on the beach at Anwangin. The sand as it turned out was volcanic ash dumped by Mount Pinatubo back in 1991. It is grayish-white in color, quite fine and, unlike the white sand you see in places like Boracay and Caramoan, can get too hot for walking barefoot during a sunny day. Our boat man and other locals told us that the sand and evergreens did not exist before the Pinatubo eruption and that the place was mostly bare rock. The eruption had apparently carried volcanic ash and evergreen seeds to the area. The locals later planted more trees in addition to the ones that were already growing. A cataclysmic event had created a place of beauty in an unexpected way. The small forest of evergreen trees and creek at the back of the beach, Anawangin Cove. The small forest of evergreen trees behind the creek is excellent for camping as well as the area right on the beach shaded by a cluster of trees. The clear waters and a number of fishes among the rocks at both ends of the cove make for good swimming and passable snorkeling. (Be sure to take precautions when swimming or snorkeling, however – see the section on Tips and Precautions below.) You can also hike to the hills on both sides of the cove and enjoy the view. We’ve spotted several trekkers camping out with their gear and have even seen a number of them up on the hills in Pundaquit, doing the trek to Anawangin. If we could only relive our younger days… With Nina’s bum knee and Leo’s bad lower back, however, we prefer to just take the 30 minute boat ride to Anawangin. Anawangin’s relative isolation has prevented development so there are no resorts in the area. However there are basic facilities such as an array of toilets and shower rooms and water pumped from deep wells. (We wouldn’t think they are okay for drinking though.) There are small stores that sell snacks, cold drinks, basic food items (even halo-halo during the hot months), soap and shampoo. Locals also charge P50 per person if you’re just staying for the day and P100 if you want to stay overnight. Use of the small picnic huts come with these charges. Before you complain about the relatively high prices of goods being sold in the stores, take note that the folks here are doing their best to keep the place clean and seem to be doing great. So let’s reward them for their good work. We’ve heard that they even take out garbage and load them on boats for proper disposal at the mainland. Take a boat from Pundaquit or from Capones Island if the latter is part of your travel itinerary (which I would encourage). It’s 30 minutes away from either origin. 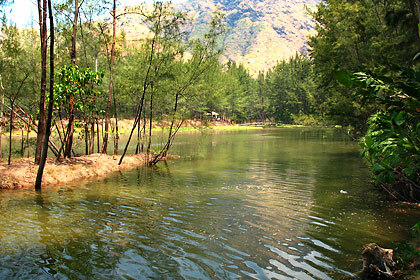 You can arrange with resorts and boatmen in Pundaquit to take you to Anawangin. On our first trip we stayed at a resort in Pundaquit for the night and arranged with the resort for a boat to take us to Capones, Camara Island, and Anawangin the following morning. It’s also possible to trek from Pundaquit to Anawangin by climbing the hills in the vicinity. We’ve read somewhere that this takes around 6 hours. 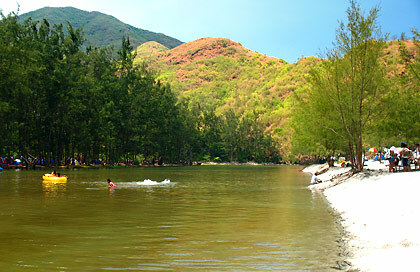 The best time to visit Anawangin would be around February and March when the weather is not too hot and it is still dry. At this time of the year crowds are not that many. 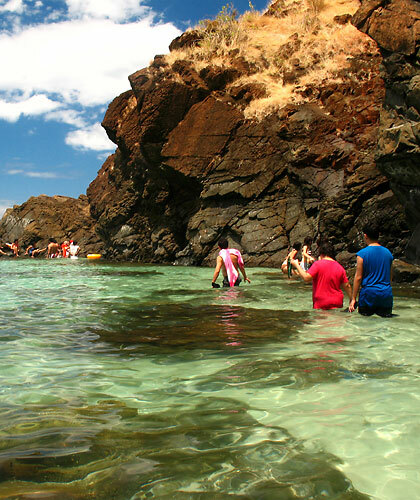 Like any other tourist destination, Anawangin gets crowded during the summer months of April and May. If you have to go during the summer try go on a weekday where the crowds are at a minimum. As with any shoestring traveler, it is best to bring your own food. The stores in Anawangin only sell snacks and basic food items. If you’re camping bring your own tent. Be careful when swimming (this applies to any beach anyway). The waves are pretty strong at times and if you’re not aware it can dash you against the rocks at both ends of the cove. The rocks are quite slippery. Don’t stray too far from shore especially if you’re not a strong swimmer. The beach is reputed to have strong and unpredictable undercurrents at times. Finally our shoestring traveler advice to all visitors in Anawangin: do your best to leave Anawangin clean and green. Submitted by leo on Thu, 10/27/2011 - 14:55. Submitted by Jenkeeeeeeens on Thu, 10/20/2011 - 13:58.